Art incites great passion. Individual artworks are adored and people become devoted to particular artists. On the flip-side, however, this strength of feeling can equally well be a negative one- many pieces of art are passionately hated. This hatred and anger often prompts the destruction of artworks, in protest at what they represent. When a leader is overthrown, we often see news footage of their statues being toppled. In 1776, George Washington’s troops actually used a statue of King George III as a weapon- melting the lead to make thousands of bullets to fire at the British. In a more personal protest, in the 1600s Royalist Prince Frederick Duleep Singh, who had a great parlour filled with portraits of the royal family, hung a portrait of Oliver Cromwell upside down amongst them. After his death it was given to Inverness Art Gallery, where it has been hung upside-down ever since. Although nowadays we are more likely to hear of members of the public running amok in public galleries, 500 years ago it was the English authorities who were destroying the people’s art, rather than trying to protect it. 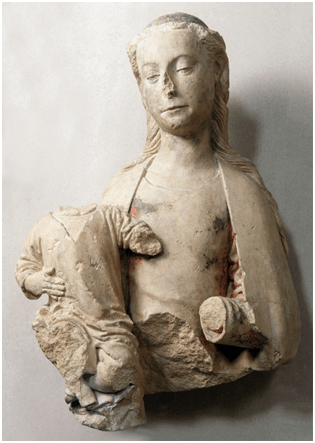 During the Reformation and after, the King’s men attacked and demolished religious art, fearing the people were worshiping it- so successfully that only around ten percent of British medieval art survives today. 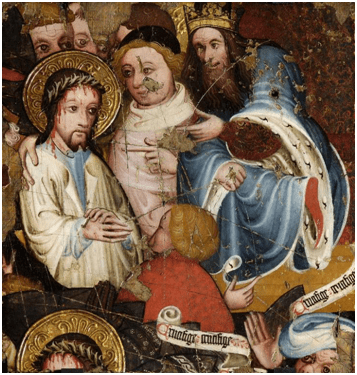 Christ before Pilate, unknown painter, c. 1400- 1425. Egg tempera on panel, 29.8 x 33 cm. Fitzwilliam Museum, Cambridge. In the early 1900s, attacking artworks became a favoured method of protest for the Suffragettes in their demands for the vote for women. They targeted numerous British paintings during 1913-1914, choosing idealised and adored images of women by male artists, in protest at the contrasting, terrible treatment that many real women received. These angry ladies’ methods clearly hit a nerve, since gallery directors considered banning women from their establishments. Destroying artworks always prompts outrage and draws attention, making it an effective method for those wanting their voice to be heard. Artworks were still being targeted in the name of women’s rights in the 1980s, when Allen Jones’ Chair was damaged on International Women’s Day in 1986. Allen Jones, Chair, 1969. Acrylic paint on glass fibre and resin with Perspex and leather, 77.5 x 57.1 x 99.1cm. Tate Modern, London. This past year has seen a resurgent spate of attacks on art in Britain, as a Rothko was targeted at the Tate and the campaign group Fathers4Justice has followed the example of the Suffragettes and called for independent acts of protest. Both a Constable painting and a recent portrait of the Queen have been defaced with the word ‘help’ in the capital in recent months. So is this use of violence against art ever justifiable? Are the artworks just innocent pawns in political games, or do their messages make them a legitimate target? A new exhibition at Tate Britain is the first to explore the history of physical attacks on art in Britain, and looks too at the way many artists are now using violence as a creative force. Check out Art under Attack: Histories of British Iconoclasm until 5 January 2014. Or if you want to read more about religious art, have a look at Ernest Renan’s Christ in Art or Nikodim Pavlovich’s Icons.